The first of May has long been celebrated with the traditional rite of spring. Dancing around the May pole is a tradition in many different cultures that dates back for centuries. 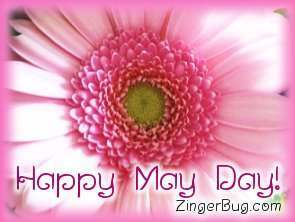 While May Day has its roots in the pagan festival of Beltane, it is still celebrated throughout England and Europe as a celebration of fertility and the coming of the new spring. Traditionally, dancers dance around the maypole and revelers feast and drink into the night! So Celebrate May Day, May 1, by sending your friends these cute comments. Perfect for posting on Blogger, Facebook, Twitter or any other social networking site or blog. These glitter graphics of fairies and maypoles, beautiful photographs of flowers and other icons of spring are sure to get everyone in a festive mood!